JoyOfStamping » Creativations 2018 – Tim Holtz Blog Hop and Give Away! 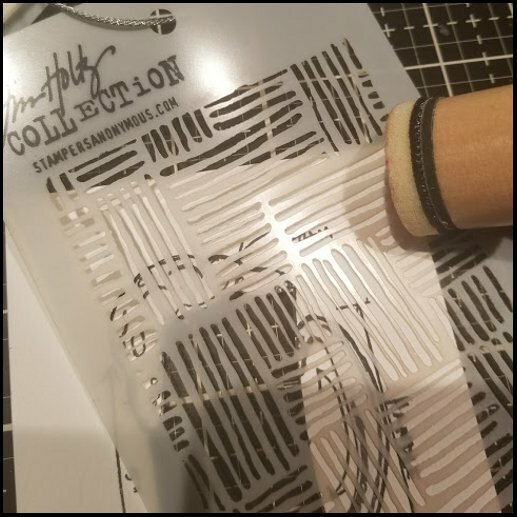 Creativations 2018 – Tim Holtz Blog Hop and Give Away! Hello! Welcome to our Creativations 2018 – Tim Holtz Blog Hop and Give Away! Did you just come from Zoe Hillman‘s blog? Isn’t she awesome? I was so thrilled when I saw that more blueprints stamps were coming out! I love the collaborations between tim holtz and Mario Rossi III (aka MJ3) I hear that these will be the last sets… which makes me sad… but I am so happy that they went out with a bang. I love love love all of these sets. 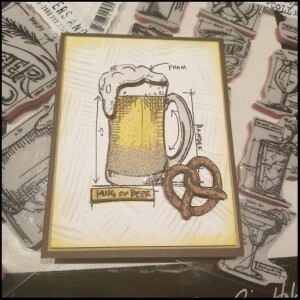 To create this card, I stamped the beer blueprint 3 times on Tim Holtz’s watercolor paper. One image will be the main image of the card. The other 2 can go on just half of the cardstock since we will only be using bits of each of the images. 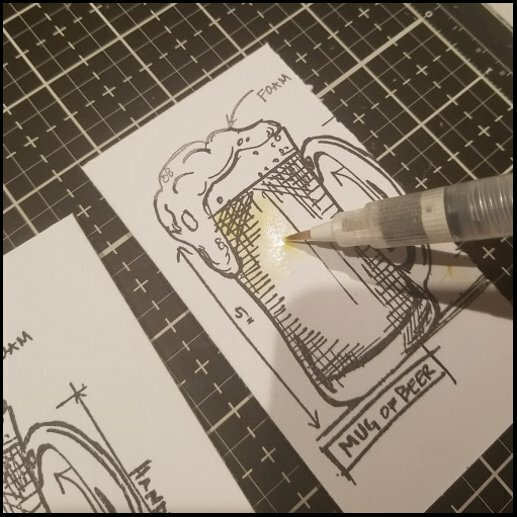 After coloring the parts of the images that I needed, I used my craft knife to cut out the center of the beer image so that we could make the shaker portion of the card. I used one of the new stencils to create my background all around the image. Then attach a piece of acetate on the back of the cardfront… just big enough to cover the cut out area. On the image that I water colored the beer, I used foam tape to create the “well” that the glass beads will “live” in. I cannot stress enough that you need to make sure that there are NO GAPS between the pieces of foam tape. Otherwise your beads (aka your beer bubbles) will be spilling through that gap. (then you will be shaking air. lol) Then you remove the release paper of the foam tape and you align the card front to match the colored beer. 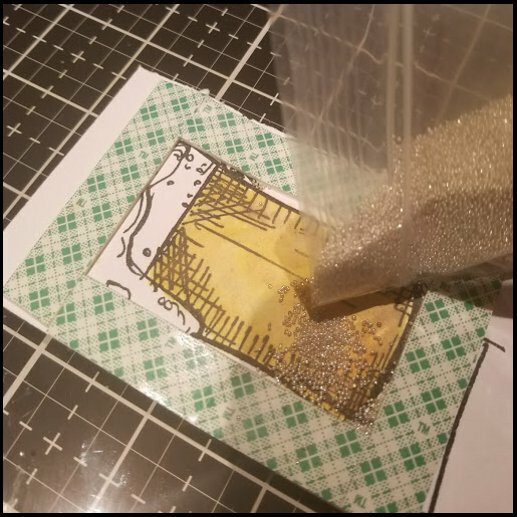 For a little extra detail, I used the pop up glue dots to a give that foam some dimension after I fussy cut the image. I added some glossy accents to the handle and the bottom of the beer glass. It gave it that extra pop. Now please be sure to check out the amazing project that Bobbie Smith has shared with us! Here is the creative line up….. I love the bubbly beer. This was really fun to see close up too! 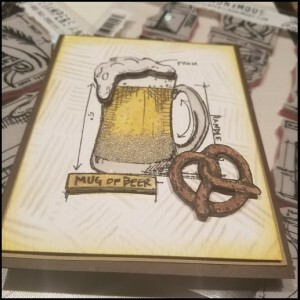 Mmmmm beeer… this is a very cute and clever card! Thanks to you, I now want this set! I love shaker cards and yours is incredible. Cheers to a great make! Love this card and I can hardly believe it’s a shaker. so AWESOME! 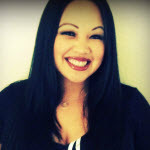 I appreciate you joining in on the Blog Hop, thank you! Great card for a guy! Fantastic “take” on the wonderful blueprint stamp! Just fab-u-Lous! Just like you! I love this joy! Love all the texture and dimension on this fun card!! Fun project! I love it. I love this card, so inspiring. I have to say I struggle sometimes to come up with cards for Gentlemen. I know a few chaps who would appreciate something like this. This is gorgeous, love the design and how you created this. Thanks for sharing the steps. You’re lucky one with the mat:) Nice cards – great gor Oktoberfest!!! I love how you used the micro beads to be your beer in the shaker card. Thanks for giving us the details and sharing your talent. Fantastic ‘beery’ shaker card, love it! Simple is good! And yet you always have a little twist to it that makes it unique and fun. I love seeing the Creativation samples, so thanks for sharing this one. It’s definitely an idea to try! you absolutely cannot go wrong with beer and pretzels! very cool card. This is such a neat card. I love the blueprint stamps. So fun and edgy. Awesome job! Love that you made the mug a shaker, so fun! Must try this ideal masculine card. Haha, this reminds me of Octoberfest! Love how it turned out! Great stamps and fabulous idea with dimenssion! freakin’ frackin’ brilliant Joy!!! love it!! thanks for sharing how you did it and for the chance to win!! Love those blueprint stamps! Neat design, great card! No need for anxiety Joy. Everyone has their own style and it is what makes it them ‘them’. Love this card, all the details and your style!!! Thanks for sharing your talent with us all. I love Blueprints (and I may have them all)! Just delighted to see more! And so perfect for those ever-difficult guy cards. This reminds me of my trip to Germany decades ago! I love how you used it – thanks for sharing all the steps! I can’t believe how detailed this was! You are a true craftsmen. This is awesome Joy!! I love how you layered the beer mug. Looks refreshing. This blueprint set will definitely be in my collection! 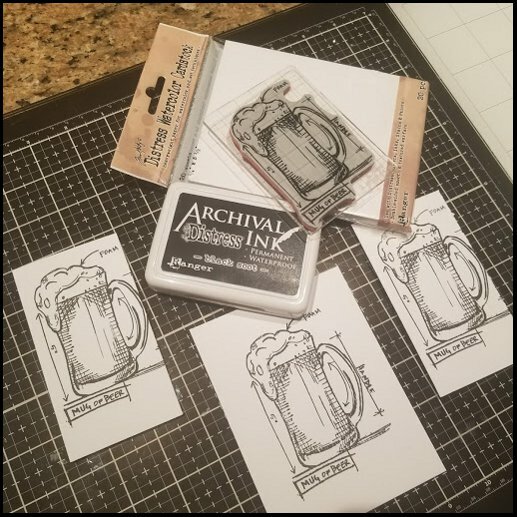 I go to our local brew pub several times a week and can’t wait to make some thank you cards featuring this set. Great idea to make a shaker card! we can all use some beer and pretzels! this is a very clever card! These blueprint stamps are pretty cool, and great idea for a shaker card! This is a very cool card for a guy! Always difficult to come up with masculine ideas. Fun, interactive card Joy….and I think YOU think outside the box!!! What a great make! just in time for the superbowl!! Winner winner chicken dinner! Love all the detail you added to make it look so believable. Cheers! What fabulous bubbly beer (the beads are a brilliant touch) – and I love the glossy glass too. I just love this set and more so I love me a shaker card! Thanks for sharing ! Joy – I always love your interactive cards – and one with beer, even better! 🙂 I, too am going to miss the blueprint stamps – I love them all. such a fun card! I just love all the “bubbles” you added! So clever Joy! I’ll drink to that !! Such a cool idea you make it look ! Love seeing your shots of various sections of that new mat ! It is definitely on my list ! I too am a great fan of the Blueprints! And your card! These stamp sets lend themselves to awesome cards and yours is super awesome! love the pop-ups and the colors! So cool for celebrations! Cheers to that! I adore shaker cards and this was so clever using the ‘bubbles’ for the shaker elements. Adding the glossy accents to the handle and bottom of the glass really was the perfect finishing touch. Love everything about this card! I love shaker cards so fun to make and receive. Love the Beer and pretzel and the 3D foam on top. Fabulous card – I need to make a card for my older brother’s birthday and it is always a struggle. Thanks so much for sharing. What you’ve done here is truly adorable. I love it – and perfect for a beer and pretzel lover. What an amazing card!!! All those details…absolutely brilliant…thanks for sharing! Beautiful wool. Can’t wait to use some of these stamps. Shaker cards are the best! Great job! How fun! I would never in a million years thought of such a creative use for those stamps! I love your shaker element! I bet you had fun making this! 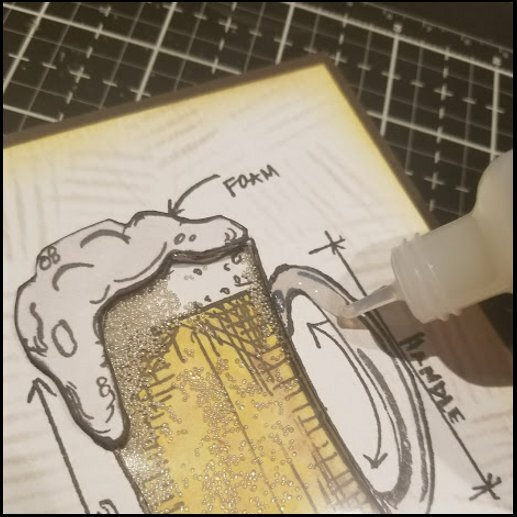 Love how you’ve made the beer look so realistic, awesome card! Love the beer! Always on the look out for masculine card ideas! Great card for the men out there. Awesome work on the beer mug. What a fantastic shaker! Super clever! This is every man’s perfect birthday card! Love it. I am so glad to see the blueprint stamps back! And I love your beer bubble and I will make sure there is no gap in the foam tape! TFS! Oh I love the addition of the micro beads!!! Cheers to cute idea with this stamp! You made me want to have a beer and a pretzel! I loved that card! I wondered what was the inside of the shaker part, so glass beads! Good idea! Thanks for sharing all the details!! What a fun and cool card! What a fabulous idea! I love the blueprint stamps and can hardly wait to get my hands on the wine set! Thank you for sharing your process for this fabulous card! I wish I could see your card in person — I bet it looks even better than on my screen! How fun! Who WOULDN’T love getting this cool shaker card!? So much inspiration!!! A must buy stamp!! looks delicious enough to drink …. yum! For both my son and sil. So cool. Thank you! I imagine this card looks even more amazing in real life than the pictures. You came up with an amazing idea and I love it! You are very talented. Be proud of yourself!!! This is the coolest shaker card ever!! Looks good enough to drink from! Such a great card. Love how the foam was fussy cut and popped up. SUCH a fun shaker card! A beer shaker! Brilliant! The idea of this, and using beads as bubbles is brilliant! Super cute project! I will definitely be using these blueprints! Can’t go wrong with beer and pretzels. This card is brilliant. 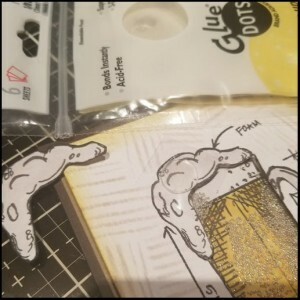 Joy, I’m impressed at all the details in this beer blueprint card, I think it’s very creative! It makes a perfect masculine card , my husband enjoys a few mugs now and then! Well done and thanks for sharing. This is not a simple card, it’s too rich in details. And so nice! i recently ordered an older blueprint christmas stamp set and i haven’t used it yet as i had no idea how to enhance the blueprint apart from some colouring, seeing this has made me want to get it out and see what i can create. Thank you for some fab inspiration. I love this card! What a clever way to create the bubbles for the drinkable looking mug of beer! Very cool — love those new images! Thanks so much for the technique tips, too!! Hi Joy, AWESOME card !!!!! This is perfect for a guy, which is so hard to figure out. I LOVE the blueprint stamps I have I think most if not all of them, I did not know that they are not making them anymore after these, this is such a disappointment, big bummer I just love them and they are part of my huge T!m Holtz collection. I loved your shaker card and thanks so much for sharing it with us. Great shaker card! The micro beads is a brilliant touch! Looks just like foam! I, too, am disappointed there will be no more Blueprint stamps. I love them. Thanks for a great card! I too love the blueprint stamps and am sad to hear this is the last release. But you did an amazing job with that shaker card- brilliant! I know you always claim to be the “simple” designer, but sister, your interactive cards are always awesome and not simple by any means. I love their whimsy and your attention to detail! !marvelous job as always my friend!! Very, very nice! Just love it! What a terrific fun card! Joy . Love how you have made it interactive – such a great idea . Thanks for sharing your step out . I love the blueprint stamps!! i so sorry to think this is the last set!!! Hopefully he’ll do more in the future!! great card! Cheers! I must have a beer! Great card! Very cool card!!! Love the fact it’s a shaker too. Really great piece of work!!!! I do enjoy a nice cold beer in the summer 🙂 Thank you for the step by step too. Enjoy your weekend. Great set for men or women for that matter. Thank you for the inspiration! What a cool shaker card, Joy! I am not a beer drinker but do have someone in mind for this beer blueprint stamp. Thanks for the inspiration. I love the creativity of using this design as a shaker card. Love your card, the “bubbles” really make it special! Love, Love your card! The shaker card and the “adult blueprints” are awesome! Can’t wait to get mine! Love it! In time for the Super Bowl. LOL Love the background stencil. I’ve never attempted a shaker card, but this one looks so fun, it’s inspirational, to say the least. So clever is the beads to mimic the bubbles. What a fun, bubbly shaker! I would find being tasked with sample-making anxiety causing too–but also exciting. You knocked it outta the park! What a great combination, beer and pretzels! Great job! I can see myself making this card for a number of people, coming, as I do, from a beer drinking country – LOL! Very creative use of the blueprint stamp. I will lament the passing of the blueprint stamps, as well. Better grab this one while it lasts. Thanks for sharing. What a great card! I love all the little details to make the foam. Nothing simple about this card – it’s brilliant! Judy D.
Wonderful card! Perfect for the guys in my life. Great shaker card! Love how you randomly used the stencil on the background!! Pröst to beer, pretzels and an awesome fun project. Thank you for showing your use of the media mat. Your project made me thirsty and hungry! Fabulous design around the beer mug!!! Also liked seeing the media mat in action. Thanks much! What a fun card. Sometimes it’s nice to go simple. Love your card. This is great – so glad I’m getting these stamps! What a great card, I love the way you made a shaker card of it. 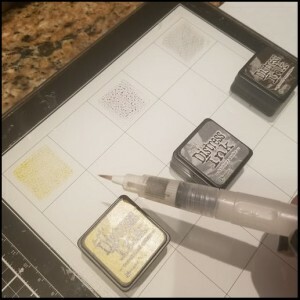 And yes I am also completely fallen in love with the Tim Holtz media mat by Tonic. Thanks for this awesome card and great idea! Beer and pretzels for super bowl Sunday, can’t go wrong with that. Super card. I freakin adore this beer card! ANd I do need this stamp set! Love the beads you used for the shaker card. You are talented and I hope you post more. Thanks for the inspiration. Great card. love it. Thanks for sharing the ideas. Perfect idea for Father’s Day! Now I’ve got a hankerin’ for a beer and pretzel! lol! Terrific!! Joy, I love the foam on the beer mug, that was a perfect thing to pop-up. The coloring is so wonderful as well. Really cool designs. Thank you. 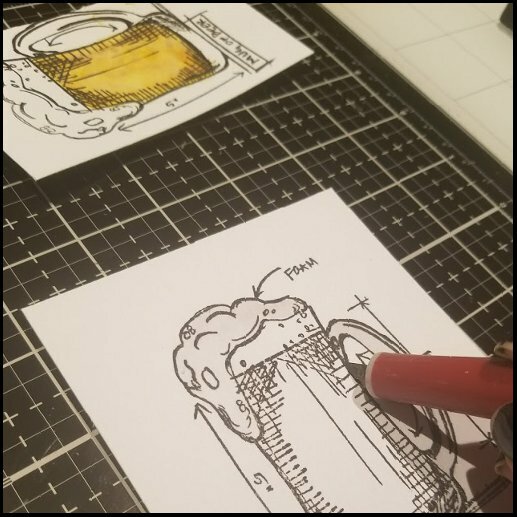 I saw your shaker beer mug on Tim’s Creativation video! I thought it was so cool, and thank you for the tutorial! It is cool. Yum! Love the glossy accents, too. Ooooooooooooooo! I pre-ordered the mini set and NOW I really can’t wait for it to ship! This is sooooo creative – love it!!! I LOVE this sudsy card! The beer lovers in my life would too! Great interactive (shaker) card! What a great idea! It was hard to see on Tim’s tour, so thanks for sharing the details. Oh, Joy, I love your shaker card. I have all the new “adult beverage” stamps on my wish list. Absolutely love this shaker card. Glad you really bought out the best in this stamps set. Too bad the MJ3 stamps are retiring. Maybe they will come back bigger and better than before. And you will be there to do them justice, Joy! These are my favorite blueprint stamps hands down! What a fun shaker card…thanks for the detailed tutorial. Sometimes simple is the only way, and the best way. Fancy is nice but sometimes just way overdone, your card is just right. I love the glossy highlights! Makes me thirsty! What a darling card! Love the layering on the beer! I had the coolest opportunity to go to Munich, and actually going to their Oktoberfest celebration, so when I saw this set of AWESOME Blueprints, I knew I’d HAVE to have them. Your shaker card has to be one of the most creative ways it could have been utilized, Ms. Joy!!! (Like you, I am also quite sad that Mario III has decided this will be his last ones :’-( every single one of them are SO much fun!) You really put together a GREAT tutorial, here! I sure hope you’ll consider doing more, as the other products are released. Thank you for sharing what you’ve done. I really enjoyed it! Perfect card for those guys that are always so difficult to make for. what a fun card!! love the sketch stamps and the beer looks good enough to Drink !! Thanks for sharing the process and details, this is so much fun! Love the effect of bubbles you created. What a wonderful idea. Great card. This card is perfect for my boy! A frothy ice cold mug of beer and salty pretzel-Yum! A fun must have stamp to have! Love all the great details-cool card! I don’t really care for beer….BUT I love this! So very clever! I love me a cold one every now and then. The stamps will be coming to live me! Great card for a man. Love the background.